Mr. Carlson just came into the pharmacy, much to the pharmacist’s dismay. Oh, the pharmacist likes Mr. Carlson. But he has a problem. “Hi, Mr. Carlson,” the pharmacist said. “Beg pardon?” Mr. Carlson asked. “I said, HI, MR. CARLSON!” the pharmacist yelled. “Oh, hi! Hey, I have a question for you,” the man said. “What it is?” the pharmacist asked. “What?” replied Mr. Carlson. The problem is that Mr. Carlson cannot hear a thing. This frustrates not only the pharmacist but also Mrs. Carlson who has threatened to leave him if he does not take action immediately. “She hates having to say something 3 times to me before I can hear her,” Mr. Carlson lamented. “I know I need a hearing aid. But I don’t know where to begin.” Mr. Carlson is 70 and was a big city police officer. As a cop, he has heard his share of gunfire, on the job and at the firing range. Years of that abuse has left him with profound hearing loss and severe tinnitus. 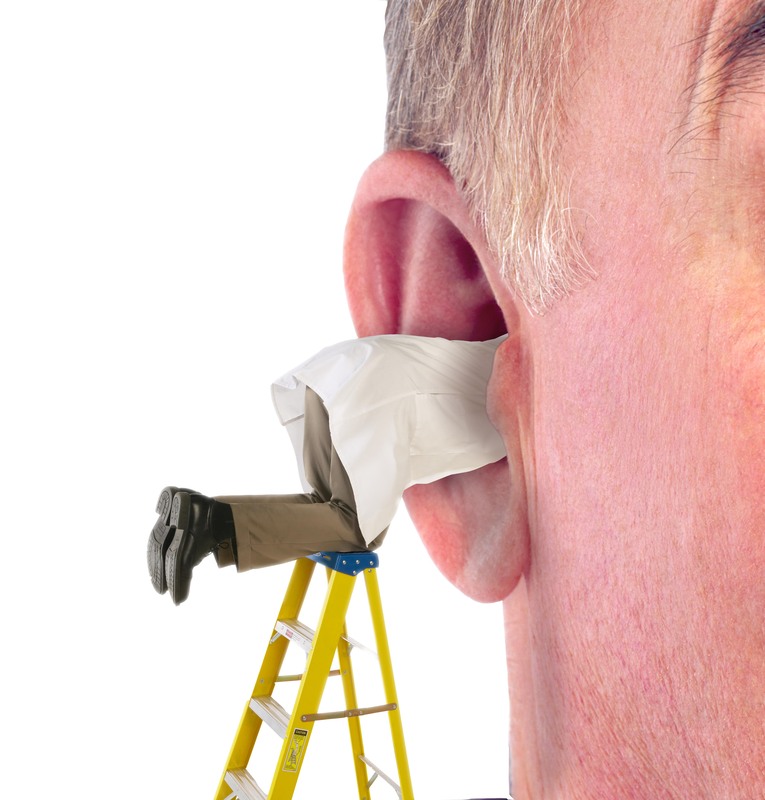 What else causes hearing loss? Earwax buildup, an ear infection, or a perforated eardrum. These factors are often correctable. Permanent but often preventable causes of hearing loss include conditions such as obesity and diabetes, as well as continuous loud noises and sleep apnea. Has the hearing loss been gradual or sudden? The goal is to find out what is causing the hearing loss and what will it take to correct it. Whatever the origin, seeing a professional should be one’s first step. But who? There are places that will give hearing tests. Think Miracle-Ear, Beltone, Costco, CVS, and Sam’s Club. Typically, an audiologist will assess a person’s auditory ability and identify if a hearing loss has occurred. However, keep in mind that these establishments often employ a hearing aid dispenser, someone who is authorized to measure hearing and to fit and sell hearing aids. They are there to sell products. Hearing aids vary wildly in price – from 69 bucks to 10 grand. How do you know if you are getting one that will help you? Not everyone has the same degree of hearing loss. You might not be able to hear very low frequencies or very high frequencies or somewhere in the middle. Generic aids, unlike digitally-programmable aids, amplify every sound where you are. You could be in a restaurant and hear a woman 4 tables away rave about her lobster ravioli. Not good. Digital hearing aids are computer-programmable. They are available in different numbers of channels. The aids break up the frequency range into individual channels. This allows the aid to differentiate ambient noise from speech. The more channels the hearing aid has the more fine-tuned it can be. Before you spend your money, you should see a doctor, called an otolaryngologist, more simply termed an ENT (ear-nose-throat) doctor. That person will approach your hearing loss from a clinical standpoint, doing different tests, taking a thorough medical history, and evaluating your loss to determine whether it is part of a bigger medical issue. This is especially important if your hearing has diminished in a short time period. When you leave the ENT’s office, you will know what channels of which you are deficient. Then when you go back to the hearing aid center, you are more fully equipped with the knowledge of what it will take to correct your hearing.